My online book promotion journey has been a journey in the desert, through the wilderness, to learn online business and here I provide you the shortcut. First, “Reset” (Forget the negative, clear your mind) “Refocus” (on your Why) Recommit (to the path, to your Why, obstacles to be overcome and all). Passion to achieve requires wisdom (a plan), Perseverance, through the wilderness, in the wisdom and this perseverance requires a continuous transformation through, the tundra, revisiting your why to empower overcoming the obstacles to achieving your why. Consequently, your Why must be worthwhile and bigger than selfishness or greed. A famous man once said, “Go draw some out and take it to the master of the banquet, who praised the groom for the Fine Wine after the guests had already had too much to drink.” He also said, “You will have troubles in this world. But fear not I have overcome the world.” I have learned, late in life from an acquaintance, a new life hack inasmuch as the why of your journey must be set. The why then becomes the lightning rod. Continuously Reset, Refocus and Recommit to your why to face and overcome the obstacles. Through the desert and the wilderness arriving for a glass of fine wine in the comfort of knowing. The first book was submitted to Angela. She is another new friend. 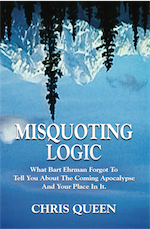 The book: “Misquoting Logic What Bart Ehrman Forgot To Tell You About The Coming Apocalypse And Your Place In It.” This author, first submitted the book to her book publishing company Booklocker.com. Booklocker, is a discriminating self-publisher, not publishing every manuscript arriving with a check. Therefore they have a stellar reputation for integrity and quality books. Also, they are a hybrid, “traditional publisher” under the moniker Abuzz Press ®. Angela is herself a writer and publishes a weekly Ezine – Writer’s Weekly –. In it she offers very good information on freelance writing and features among other things paying freelance writing jobs. Every writer, serious about a freelance writing career should subscribe to her E zine. She offers great advice and her own books on such topics as “Book Proposals That Worked”. She raises the battle cry against default C Section where a woman has been delivered that way one time, the medical community, opt for the repeated C sections, in her book, “Don’t Cut Me Again.” By Angela Hoy, she advocates for a woman’s right to choose natural birth. Subsequently, my manuscript was approved, two hours, or so after submission, I was enthused. Designed, formatted, for paperback and Ebook cover designs all tidied up with back cover and website text etc., for just $ 875.00. A bargain compared to all other self-publishers, often wanting $ 3500.00 or more. Booklocker offers a payment plan also @ 50.00 per month (totaling $ 1045.00) for struggling authors. Most important they pay the highest royalties of any POD self-publishing company. Like Steve Martin I was essentially joyously shouting “The new phone book is here.” Consequently, online book promotion became important, since the world was not buying nor even looking. Had previously given up in promoting a CD and electronic downloads @ $ 0.99/ song or $ 9.99 for all 12 tracks. CD in Jewel case $ 12.97 all shipped to those millions online shopping from CD Baby, Amazon and all the rest of the online marketing outfits. It’s a good record too. SAMPLES TRACKS HERE They were shopping for the well known artists who’d made a name promoting themselves or being promoted by others. Link the new book website, genuinearticlex7 to the also unsuccessful CD website. But how? Then the near zero visitors could travel back and forth with the click of a mouse. How now brown cow, a favorite of my dad’s. How became the important, question, not just the why? The CD released quietly in 2014 and the first book released on May 30, 2017 also at Amazon, to this point reached the threshold hoped for. OK. Dreams of instant success give way to the usual expected obstacles. The books were written after earning a degree in mechanical engineering (Rock Chalk) done to remedy the deprivation through 1989 skiing injury. Permanent mis-solution to a temporary setback. Also, after the brief engineering career where wisdom had yet to bring her idea home, to the aspiring author. Prior experience indicated clearly employee-employer relationship was not this writer’s cup of tea. Living out the family programming was useless. Further came the discovery that not all with degrees possess the competence required for their chosen field. Visionaries and the Brilliant are unwelcome in a field of mediocrity. Dad was a mechanical engineer involved intimately in design of the B-52 fuel injection (as a designer) before entering the Air Force desiring to be a fighter pilot near the end of the Korean War. He met this writer’s mother while instead, fulfilling his hitch as a B-47 Jet Engine Mechanic. This blogger here, was born in 1957. In 1958 the babe in arms returned to Washington State, the original home of his dad. Seattle University and evenings of homework are his first memories of his dad. Boeing, Top Secret Clearance, the Minute Man Missile, was what his dad was up to next. The targeting programming, dad contributed too, meant the Minute Man could drop on the blast door of a Soviet Missile Silo. Incidentally this from the thousands of miles away from the targets; where these missiles were deployed. Kennedy had the better guns and the other team knew it. Un-recalled, who in that administration said the famous words, “The other fellow just blinked.” Next the family headed for New Orleans in early 1963 for Apollo. The intermediate step of the Gemini program then (or Geminee, as the space race people and the press called it) under way. The progression to enhance the skill level required, for the coming “moon shot.” Skill required to reach another astral globe a mere 240,000 nautical miles away. Skeptical? Don’t let Buzz Aldrin hear you say that. Good Job Buzz! Fuel delivery system was this blogger’s dad’s area of contribution, with five Saturn SV1 engines. Each F-1 engine fed from three each 45,000 H.P. pumps (most powerful fuel pumps ever designed) turning at extraordinarily high r.p.m. The first 2 ½ minutes the craft reaching 6,000 m.p.h. (zero to 6,000 in 2.5 minutes) consuming 20 tons of fuel per second. Expending an Olympic size swimming pool of liquid oxygen and kerosene in 2 ½ minutes, the problem was delivering that amount in that time toward escape velocity. The five F-1 engines producing 7.5 million pounds of thrust (Apollo 11) lifting the 6.2 million pound rocket of which 4.7 million pounds, was the fuel for the first 2 1/2 minutes of incredible acceleration. Dad, you and your colleagues built quite a Hot Rod. I believe it still holds the record. Writing tonight on my new page for my blog. Wild, it’s WP Leslie (no swaying palm fronds distracting attention) just like my book website. Two nights ago without WP Support I logged into the dashboard and wandered around. I know exactly what all of the buttons and knobs mean and do. Very cool. Now growing in control of my own destiny as to internet pay for actions. No more heated exchanges with WP support. I am WP Support, though I still have a lot to learn, I grow in fending for myself, daily. More offers there in your own blog, than the largest shopping mall on earth. With a Billion in your virtual city as potential traffic, and something here for everyone. Aside from that, you gain instruction for successful application to Google Ad Sense, Google and Amazon for monetizing your site. P.T. Barnum featured and promoted his Circus, the Ringling Brothers and Barnum and Bailey Circus across the nation in times past. Elvis Presley became the biggest star in early Rock-N-Roll history under the watchful eye of promoter Colonel Tom Parker. Elvis, from Tupelo, Mississippi, a country boy image, with heart breaker good looks and style of song delivery might have been a star no matter what. Another band in a Norther English Seaport called Liverpool, The Beatles also had a great manager/promoter named Brian Epstein. Selteab (Beatles spelled backwards), the Beatles promotional concern (Beatles Movies), Beatle Wigs, Beatle Boots, Beatles Posters, Beatles Trading Cards, Saturday morning children’s cartoon, even the promotional alter name, The “Fab Four” came from the genius and visionary promoter. Now the world has a visionary, promoter (advertising professional), coach, teacher and cheerleader named Rory who has generously forged his vision as duplicate-able, to end necessity of being stuck in the programmed role of employee, instead giving any with incentive the means to achieve independence and the knowledge to promote his offers and anything else of quality. So come and promote yourself to CEO, because the title, “employee” offers most, only a bleak future. Set yourself free! THIS IS BETTER THAN A 401K. If you’ve become wise, you can register your name and Email on the right, for updates. Remember: Three percent of the people make things happen. So Make it happen! GO HERE TO START NOW!